Videx, the experts in access control and door entry, has enhanced its popular range of hands free colour video monitors with a new matt black soft touch finish. The monitors, which feature a 7-inch-high resolution colour LCD screen are now available in both a matt black or satin white finish for a number of our popular door entry systems. The monitors are available with a video memory feature that can be used with or without a Micro SD card to capture an image or short video of a caller enabling the occupant to see any visitors they may have missed throughout the day. Without the Micro SD card installed, the 6700 Series is able to store up to 100 still images of the caller while with a Micro SD card it’s possible to store up to 4096 still images or up to 512 15 second video clips of callers. The facility can be used manually where the user can press a button to either take a picture of the caller, start recording a short video clip or it can be used in an automatic mode where the picture/video clip will automatically be taken when a visitor calls – allowing the user to review any missed calls when they arrive home. The Micro SD card can also be removed allowing the images and video clips to be used in another device such as a mobile, tablet or PC. Currently the monitors are available for the full video kit range, VX2200 6 wire system for low and high rise apartments and the VX2300 2 wire system enabling these monitors to be used in one apartment systems through to systems with up to 1000 apartments. 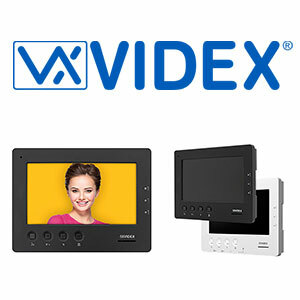 For more information about the new 6700 series video monitor range and the new matt black monitors, please visit:www.videxuk.com or call 0870 300 1240.